Prior to the release of his second solo album, the Circa Survive frontman throws down some real talk about where he’s been and where he wants to be. Anthony Green might agree that being in a band is an excuse to stay frozen in arrested development. But what happens when having a child of your own enters the picture? AP learns how WILLIAM BECKETT and members of TAKING BACK SUNDAY, THRICE, EISLEY and AIDEN balance having kids and playing gigs. The Arizona rock delegation want to be known for their music, not their scene hair. And when some people had a problem with that, the band took control of their destiny. MEGA-POSTERS of MY CHEMICAL ROMANCE & BLINK-182! Featuring advice and inside information from TAKING BACK SUNDAY, DESTROY REBUILD UNTIL GOD SHOWS and more. Get tips about the hottest tees, hoodies, gear, games, gadgets and much more! BANNER PILOT, GOOD LUCK, A LOT LIKE BIRDS and more. Ice covering your windshield? 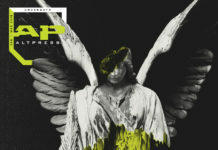 Fear not: THE AP RECORD STORE is stocked with hot tunes to help it melt away, including new albums from ENTER SHIKARI, FOXY SHAZAM, ATTACK ATTACK!, HIT THE LIGHTS, NADA SURF, LACUNA COIL, CRAIG FINN and more. Sick of clearing out your driveway at the crack of dawn? 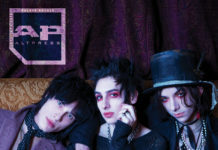 Let AP’s playlist make this chore not so much of a pain. 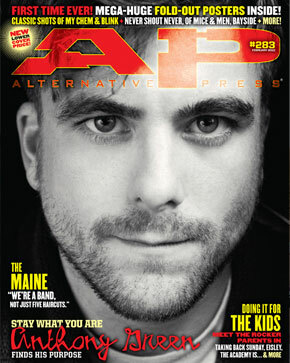 Next articleAnthony Green Is The Cover Star of AP 283!